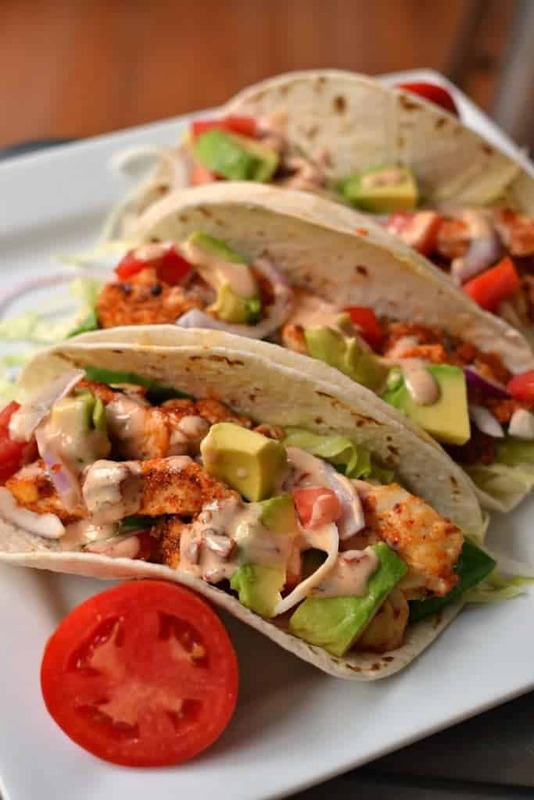 Chicken Taco Recipe combine seasoned chicken, crisp lettuce, sun kissed tomatoes, sweet red onion and buttery avocado drizzled with a chipotle ranch dressing. This delicious recipe can be on the table from start to finish in 30 minutes. I have come to believe that tacos are a necessity in life. It is one of those delicious dinners that gets overlooked quite often. Then when you cook them you ask yourself why do we not eat these once a week. 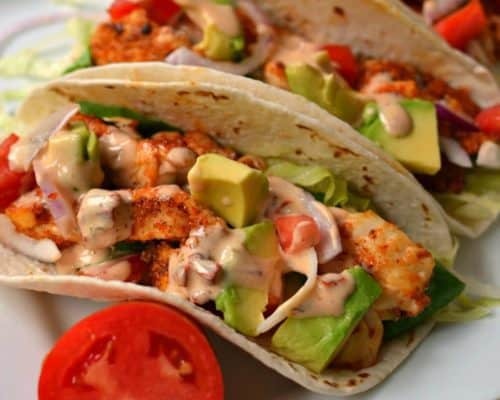 These scrumptious Chicken Tacos are quite versatile and can be prepared with soft or crispy tacos. They are a big hit with the kids and the adults can dress them up a little more if they like. How to make Chicken Taco Recipe. First in a small bowl stir together ranch dressing, chopped chipotle peppers, adobo sauce and lime juice. Then place bite size pieces of chicken in a plastic bag with taco seasoning and shake. Add a little oil to a skillet and cook the chicken until browned on both sides and cooked through. Work in batches as the chicken cooks better if it is not crowded. Warm the tortillas or taco shells. Layer with shredded lettuce, cooked chicken, diced tomatoes, red onion and avocado. Drizzle with Chipotle Ranch Dressing and serve. What toppings to add to Chicken Tacos? 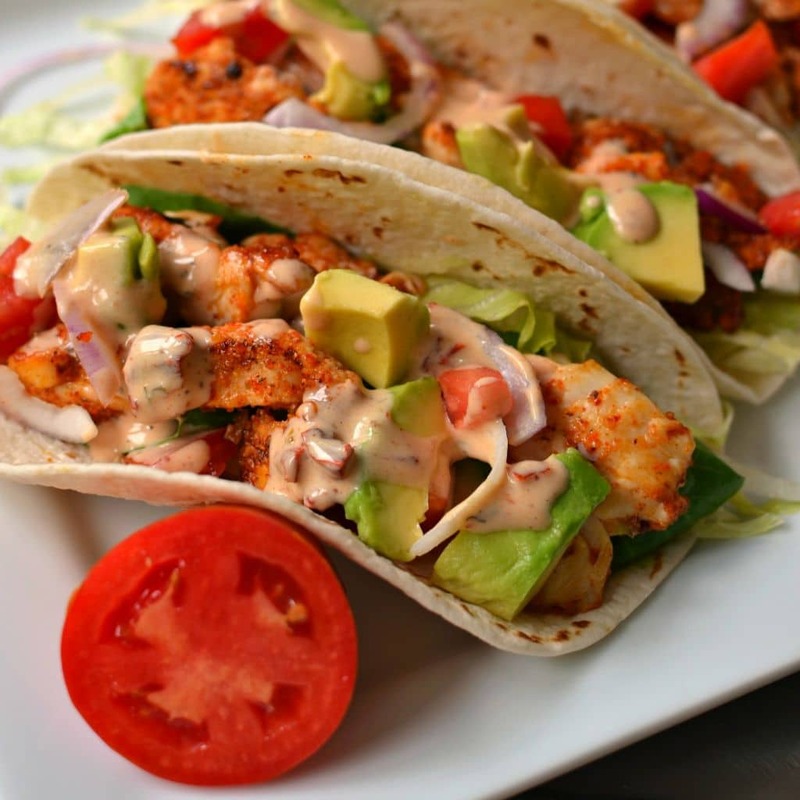 Taco topping are really a matter of personal preference but here are a few suggestions to try! Helpful hints to make this Chicken Taco Recipe Epic! Cut your chicken breast slices about 1/3 inch thick consequently it will brown on the outside at the same time that it cooks all the way through. Make your sauce first and store in the fridge so that assembling the tacos is quick and trouble free. Wrap tortillas in damp paper towel and microwave for 30-40 seconds right before assembling the tacos. Cut all the vegetables and have your toppings ready to go right before cooking the chicken. This makes it easier to serve warm tacos! Put the ingredients for this Chicken Taco Recipe on your shopping list today and make you and yours an awesome meal. I hope you and your family enjoy these tasty tacos as much as we do. Other taco recipes you will love! 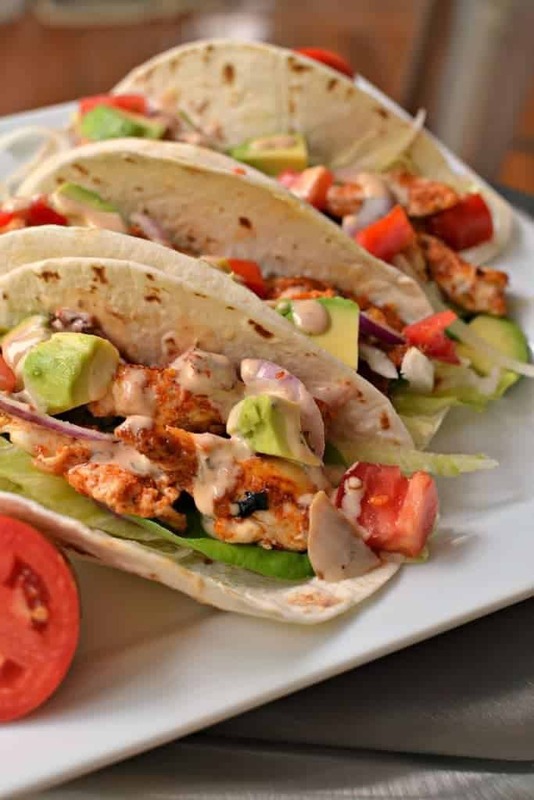 Chicken Taco Recipe combines seasoned chicken, crisp lettuce, tomatoes, sweet red onion and buttery avocado drizzled with a chipotle ranch dressing. In small bowl stir together ranch, chipotle pepper, adobo sauce and lime juice. Cover and place in refrigerator. In large Ziploc bag add chicken and taco seasoning. Shake to coat. Heat 1 tablespoon oil in large skillet. Brown chicken on both sides; making sure that is cooked through. Work in batches. Do not crowd the pan. Add more oil when necessary and remove to plate when cooked. Cover tortillas with damp paper towel and microwave for 30-40 seconds. Layer warm tortillas with lettuce, cooked chicken, tomatoes, red onions and avocado. Drizzle with chipotle ranch dressing. Chipotle peppers packed in adobo sauce are in the Mexican food section of most grocery stores. You only need one chipotle pepper but you can freeze the rest for future recipes. Freeze flat in a freezer bag then you can break off a piece when you need it. It’s been WAY too long since I’ve last made tacos. Looks delicious! 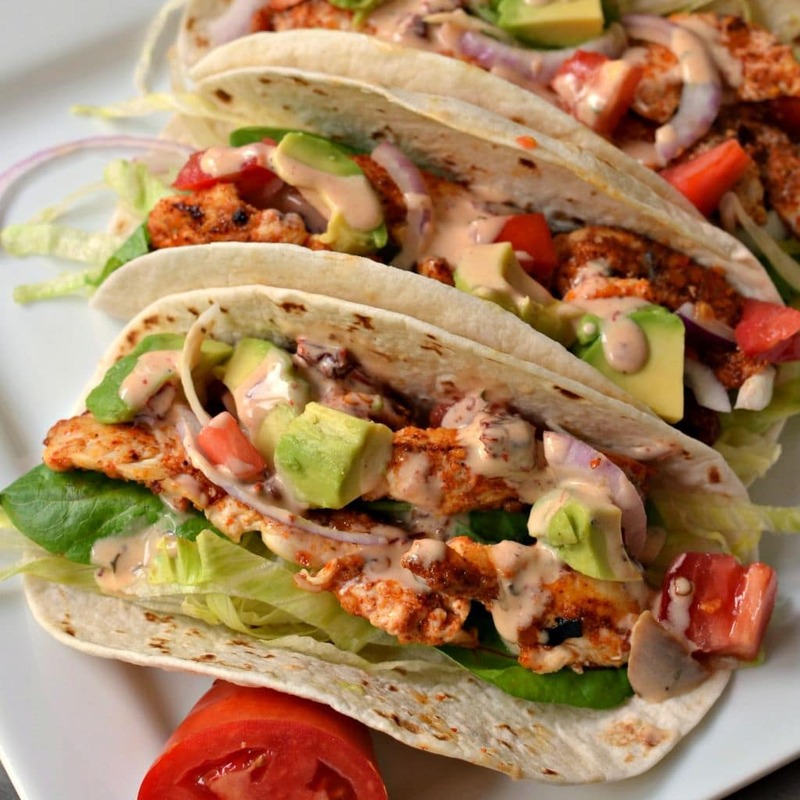 This chicken tacos are so perfect for weeknight dinner! So easy and delicious! That chipotle ranch drizzle is fantastic! I’ve got to make this for dinner tonight! !